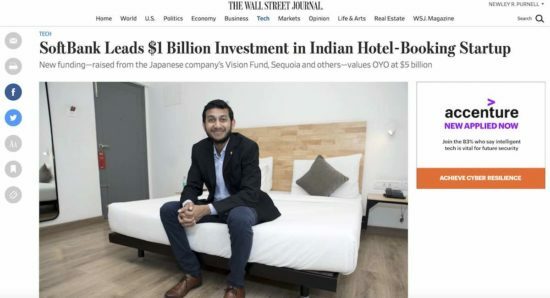 SoftBank Group Corp. is doubling down on one of its biggest bets in India by leading a $1 billion investment in hotel-booking startup OYO Hotels. The company, based in Gurgaon, India, has received $800 million in a round led by SoftBank’s Vision Fund, which SoftBank Chief Executive Masayoshi Son is using to back cutting-edge technologies, OYO said Tuesday. U.S. venture-capital firms Sequoia Capital and Lightspeed Venture Partners also contributed to the round, and existing investors have pledged a further $200 million. “We plan to rapidly scale our business,” with a focus on continuing OYO’s expansion into China, said 24-year-old company founder Ritesh Agarwal in a written statement. OYO also operates in Malaysia, Nepal and the U.K. The new round of funding values the company at $5 billion, including the new funds, according to a person familiar with the matter. That is up from a post-money valuation of roughly $850 million when OYO received $250 million last year in a round led by SoftBank.